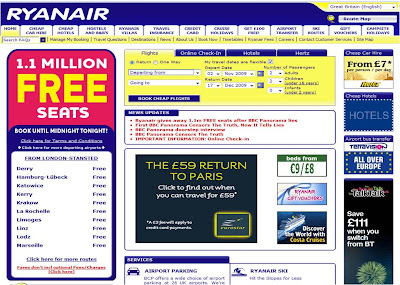 Eurostar ads on Ryanair website?! Since the beginning of this year Ryanair have been monetising their customer website by selling ad space on the homepage with various ad sizes available - the most prominent being the MPU in the centre of the page. Even though Ryanair don't fly from London to Paris or London to Brussels, I was still surprised to see the Ryanair homepage carrying prominent display advertising for Eurostar recently! It appears that I'm not the only one to have seen these Eurostar ads on the Ryanair site - a thread on Airliners.net discusses the same placements (though they noticed the Eurostar ads a few months back.) I don't understand the logic behind this. Why allow another travel company to advertise in the centre of your homepage - surely the risk (potential lost bookings) is greater than the gain (incremental ad revenue)?